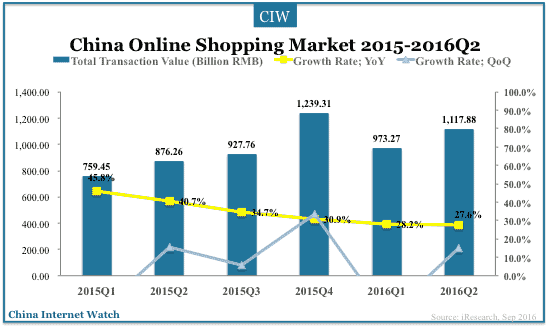 Online shopping represented 14.3% of China’s total consumer retail sales in Q2 2016. And, B2C accounted for 54.5% of total online shopping transactions, led by Tmall (54.5%) and JD (26.3%). From January to June, the total retail sales of consumer goods reached 15,613.8 billion yuan, up by 10.3 percent year-on-year. according to National Bureau of Statistics of China. The online retail sales of goods and services was 2,236.7 billion yuan, increased by 28.2% year-on-year. Mobile online shopping market reached RMB 783.44 billion (USD 117.4 bn) in Q2 2016 in China, an increase of 75.9% YoY, accounting for 70.1% of total online shopping transactions. Alibaba continued to dominate China’s mobile shopping market in Q2 2016 with over 80% market share.